Let’s start with the back side, so we don’t have to worry about shaping a neckline just yet. First of all, place the stitches for your neck or collar on a holder for later. The rule of thumb is to divide the gansey into thirds – one third of the stitches for the left shoulder, one third for the neck, and one third for the right shoulder – and I find this works pretty well. Now let’s say we’re going to knit a traditional ridge and furrow (“rig and fur”) shoulder strap. This is not only very easy to do, it has the beautiful advantage that the cast-off row where the two halves join in the middle just blends into the pattern and looks for all the world like a central ridge. It’s elegant and functional all at once, and is my favourite type of shoulder (did I mention how easy it was?). Take 2 double-pointed needles. Pick one shoulder to start with. Place the number of stitches for the shoulder on one of the double-pointed needles. 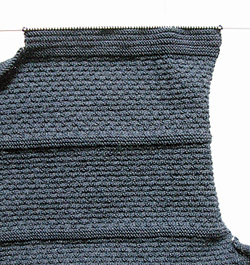 Then, knitting back and forth, knit 3 ribs (each rib to consist of 4 rows, and looking at it from the right side the order of rows will be purl, purl, knit, knit – though obviously the actual stitches you are knitting will depend on which way each row is facing in relation to you at the time). The important thing is to ensure that the last row, looking at it from the right side, is a knit row. 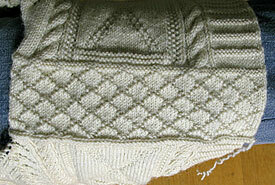 It is helpful to knit this row slightly looser than normal, too. The 3 ribs, each of 4 rows, come to 12 rows, or an inch. Place these stitches on a holder, and repeat for the other shoulder. When you come to knit the other side, you can repeat exactly the same process for a traditional neckline. This gives you a rectangle for the collar, 2 inches deep, and as many inches across as a third of your gansey comes to – about 7 or 8 inches. But if you want a shaped neckline on the front of your gansey, just start the process a little earlier. Decide how deep you want the neck to be. When you reach that point, divide the total number of stitches into thirds, as before – one third for each shoulder, and a central third for the neck. Now divide your central third for the neck into thirds again. Put the middle third on a holder, and set aside. Let’s say you start on the left shoulder first. Take a double-pointed needle, and place on it all of the stitches for the left shoulder strap, plus one-third of the stitches from the centre – all of the stitches from the left armhole of your gansey to those you’ve set aside for the neck, in fact. Now, knitting back and forth with another double-pointed needle, carry on knitting the yoke, but decreasing on the right-hand (middle) edge at a rate of 1 stitch every second row. Keep on doing this until you have decreased down to the number of stitches you’ve allocated for the left-hand shoulder strap (the original third). If you reach this point before you’ve finished the yoke pattern, no matter, just keep on knitting straight up without decreasing until the end of the yoke. Then you just knit the ridges and furrows on the shoulders as before. There are plenty of other ways of making a shoulder strap, though the ridge and furrow technique is probably the most common. For example, you can knit a panel for each shoulder from one side only, instead of doing it from both sides and joining them in the middle. This was quite common in Scotland. The advantage of doing this is that you can create a complete patterned panel without a disfiguring cast-off join running down the centre. If you knit the shoulder panel from the front side, the join comes at the point where the shoulder joins the back side, so is less visible. Probably the most spectacular, and the most complicated, type of shoulder strap is where you have a cable starting at the neck, running down the shoulder and continuing unbroken all the way down the arm to the cuff. To do this, you knit the front and back yokes but stop before you knit any of the shoulder straps. Divide your gansey into thirds, one third for the neck and one third each for each shoulder. Start with the left shoulder. Place the stitches for the front left shoulder on a double-pointed needle and do the same with those for the back, same shoulder. Now, take a third needle and cast on enough stitches for your cable plus however many flanking pattern stitches you wish to have on your shoulder. Then knit that cable and pattern at a right angle to the rest of your gansey, working down the shoulder. At each row’s end, join the last stitch of the row with one shoulder stitch from the needle holding that side’s stitches, and cast it off. When you reach the end of the shoulder, place the cable and its flanking pattern stitches on a holder, ready for when you pick up stitches to start the sleeve. The only point to bear in mind is that you will have more rows per inch than you will have stitches per inch – probably in a ratio of 4:3 (one inch for me equals 12 rows and 9 stitches). So if you’re not careful, you’ll be knitting 12 rows for every 9 stitches you pick up along the edges, and this will cause your cable to bump up like the streets of San Francisco. So as you go along, I suggest you either decrease 1 in 4, or slip 1 in 4 stitches, to keep it even. Like I say, it’s a bit complicated – but the results are certainly impressive. Hello Gordon, and thank you for this marvellous and inspiring website. I am now knitting my first gansey. I am tempted to have a go at this Hebridean-inspired way of doing the shoulder strap, as I like the idea of a cable all the way down the arm. I have understood your instructions, I think. I just need some help to understand the bit at the end. If I understand correctly, you’re saying that that the distance between rows is smaller than the distance between stitches, so the perpendicular rows on the shoulder strap won’t align with the horizontal stitches on the body of the garment. 12 rows is shorter than 12 stitches. Good point. I see the problem. But I don’t understand your instruction for how to solve it. Sorry to be thick! I need to increase the number of rows in the shoulder strap somehow, or decrease the number of stitches as I pick them up from the shoulder. Is that right? When you say “decrease 1 in 4 stitches” do you mean, for example, “At each FOURTH row’s end, join the last stitch of the row with TWO shoulder stitchES from the needle holding that side’s stitches, and cast THEM off.” – i.e. decrease the shoulder stitches by knitting two together? Would It be a good idea if I did that decrease in the penultimate row of knitting the body, for example, rather than complicating this joining and casting off process? I don’t think you mean I should decrease the width of the should strap? I’m trying to visualise it. Could you explain again what you mean by “decrease 1 in 4 stitches” – thank you very much. Another thought – it’s two “strap” rows to one “body” stitch, isn’t it (across and back)? So in fact, if you have 12 rows to the inch, and 9 stitches to the inch, then the problem will be that there are too many rows (not too many stitches), because 2 rows are bigger than one stitch. The problem is helped, but not removed, by the fact that row spacing is smaller than stitch spacing. 2 rows are not double the size of one stitch, but maybe one and a half times as big. This is why the cable will pucker up and make San Francisco hills. I am still puzzled what to do about it, and how to “decrease 1 in 4 stitches”, and why that will help. Thanks for your comment. I’m probably not in the best state to be giving advice at this time of night(! ), but I’ll have a go :-). You’ve got the problem perfectly, as far as I can see – and so you have to reduce the number of stitches by 25%. Say you have a gansey that is 216 stitches across the front (and the same across the back). Let’s say you take a traditional approach, and divide it in three: 72 stitches for shoulder A, 72 stitches for the neck, and 72 stitches for shoulder B. You need to reduce the 72 stitches on each shoulder by 25%, or 18 stitches, to avoid the bunching up effect. Now, I tend to do this on the last row before I start the shoulder strap, so it’s all ready to go: but at least one correspondent (who is a much more experienced knitter than I) suggests decreasing as you pick up the stitches as you work down the shoulder strap. I think, whatever works best for you is fine. Ah! Thank you Gordon. yes you’ve answered my question. The light has dawned. 12 rows to the inch, 9 stitches to the inch. You want the number of rows to be equivalent in inches to 72 stitches.72 stitches for you is ’72 divided by 9′ which is 8 inches. This is the length in inches of shoulder A. So you reduce the number of stitches by 25% to give 54 stitches. 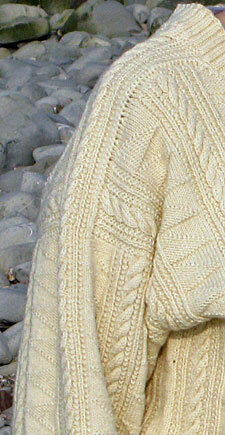 Then on the shoulder strap you knit backwards and forwards between 54 stitches which gives 54×2=108 rows. 108 rows for you is ‘108 divided by 12’ which is 9 inches. 9 inches is not exactly the same as 8 inches but it’s near enough. So you might get a bit of bunching but not much. I like the idea of decreasing in the penultimate row. Somehow that helps me work out what’s going on! Thank you so much. I hope you are feeling better and recovered from your cold – and I look forward to the book! Great site, many thanks for the loads of information. I’m knitting my first gansey and have done the shoulder on one side. However, I’m unclear what to do once I’ve knitted the 12 rows. I put on a stitch holder but HOW TO MOVE THE YARN TO THE OTHER SIDE? What happens to the yarn? Or do I tie new yarn for the other side? Hi Dennison, I’m afraid there’s no easy way to carry the yarn over to the other shoulder—or not one I’ve come across, anyway. I put the completed shoulder stitches on a holder and cut the yarn, leaving an end of a few inches to be darned in later. Then I start again on the other shoulder, effectively tying new yarn for the other side, as you say. Do you have any instructions on how to knit shoulder to neck gussets please? Hi Jean, I’m afraid it’s something I’ve never attempted, sorry. I looked them up and I see that Beth Brown-Reinsel in her book “Knitting Ganseys” has instructions, charts and photos (on pp.96-100) on several ways of doing them. Dear Gordon, now back to basics. Which kind of stitch should I use to join the shoulders? I have elsewhere instructions to use “Ridge bind off”. I don’t know that one and I usually prefer to overcast to stabilize the seam. What would you advice? Hi Chris, i guess it’s really a question of preference. I sue the “3 needle bind-off” technique, which has two advantages for me: firstly, and most importantly, it’s easy(! )—and secondly, if you’ve done a “ridge and furrow” shoulder it just disappears into the ridges already created and is invisible to the untrained eye. Great web site – thanks.